Texture: Silky with no undercoat. Miscellaneous: Heavy ruff is desirable, especially in males. Fur can be slightly curly on the stomach. Seasonal changes should be considered when judging coat length. Gloves and Laces: All Birmans should have white feet. Front paws have white gloves, preferably ending in an even line across the paws at third joint (where toes meet paws). Birmans should have white feet. 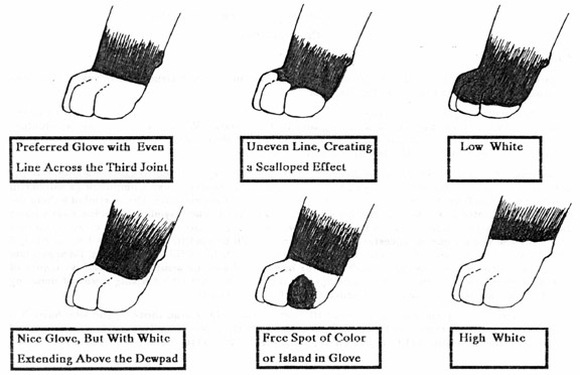 Front paws have white gloves, preferably ending in an even line across the paws at third joint (where toes meet paws). The back paws have white gloves covering the front of each paw, extending up the back of the legs ending in a point approximately half way up the hock (“laces”). Evenly matched gloves and laces give a more balanced look, but variations are allowed. The paw pads may be all pink or spotted with color the same as the points. Gloves and laces are weighted equally in evaluation. Although the gloves and laces are important aspects of the Birman, they are secondary to conformation. 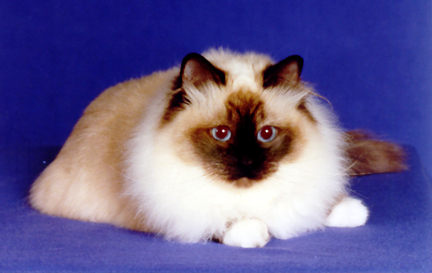 Color: Birmans are pointed in all colors. Coat color and point color are weighed equally in evaluation.